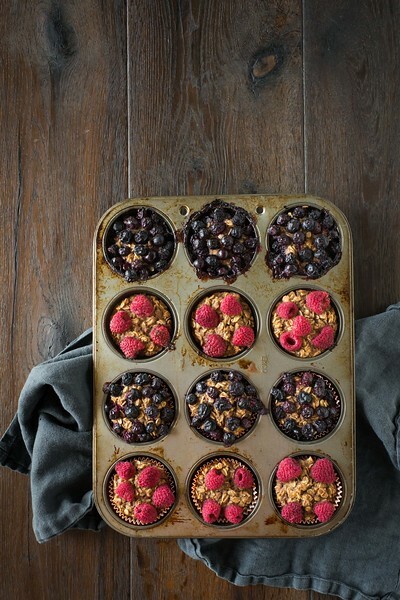 Yum team member, Wendy, was introduced to this amazingly delicious and healthy muffin recipe by her fitness coach. These are great to grab for a quick breakfast on the go or a hearty snack! We got rave reviews from all ages. In order to make this recipe vegan, use an egg substitute like chia or flax. The simple combination for the equivalent of one egg is 1 tablespoon of chia seeds or ground flax seeds to 2.5 tablespoons of water. Mix and let sit for 10-15 minutes. The result will be a gelatinous mixture that acts like an egg in many recipes! Preheat oven to 350 degrees. Prepare twelve muffin cups with non-stick spray or muffin wrappers and set aside. In a large bowl combine eggs (or chia eggs), vanilla, bananas, and honey. Mix well and set aside. In another bowl mix together oats, cinnamon, and baking powder. Add the oat mixture to the egg mixture and mix. Add almond milk and mix well. Divide the muffin mixture evenly between the prepared muffin cups. Top muffins with berries. Bake for 26-30 minutes until golden brown and toothpick inserted in the center comes out clean.